Plant God's word in your heart. When an apple farmer plants an apple tree in his orchard, he does so for one reason, to produce applies. The apple farmer did not want a harvest of pears or oranges or peaches; the apple farmer wanted a crop of apples. So, if the apple farmer expects to have a crop of apples, he must first plant an apple seed or plant an apple tree in the ground. If a Christian hopes to bear fruit for God they must first do the following four things. (1) The Christian must read the Bible daily, the apostle Paul said, let the word of God saturate your mind, heart, and spirit (Col.3:16). (2) The believer must pray to the Lord to open his or her understanding that they will be able to understand the Scriptures (Lk.24:45). 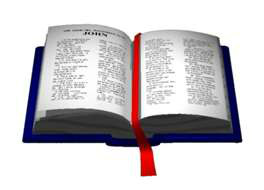 (3) The follower of Christ must apply the Scriptures to their daily life. James said, be doers of the word (James 1:22). (4) The Christian must believe that God can perform what He has written and promised in His word. Before a farmer can plant an apple tree, he must first go through the process of digging a hole in the ground, and then he can plant the apple tree in the hole that he had just dug for the tree. Like the farmer, before a Christian can plant God’s word deep within his or her heart, they too must first go through the process of picking up the Bible and read what God had written to them in His word. Every farmer knows the more seed they plant, the more apple trees it will produce. Likewise, like the farmer, the more a Christian reads the Bible, the more the heart becomes saturated with God's word. Jesus compares a Christian to that of a branch, and Himself as the vine, and His heavenly Father as the vinedresser (Jn.15:1). Like the apple farmer who prunes his apple trees to encourage fuller growth, likewise, God prunes the Christian that they too may bear more fruit also (Jn.15:2). Before a farmer plants a seed in the ground, he or she must have a good understanding of the soil which they intend to use for planting. Every apple farmer knows if they expect to have a healthy crop of apples they must plant their seeds in well-draining soil, and also the farmer needs to water and fertilize their crops according to the recommendations on the back of the packaged seeds. Like the fertilizer, farmers use to cause growth within a plant, likewise, God’s word fertilizes the heart of men and woman and causes their faith to grow (1-Pet.2:2) (2-Th.1:3). If a farmer hopes to have a successful harvest at the end of the apple season, they must follow the instructions which the manufacturer had placed on the back of the packaged seeds. Like the Seed Company who gives instructions to the user on how to care for their seeds, likewise, In the Bible, God has written instructions on how Christians are to conduct themselves in this life (Rom.6:4) (Gal.5:24-26). A friend of mine told me about a young man who wanted to be a farmer, so, he attended several different Schools, college, and universities so he could study and learn everything he could about farming. My friend said after several years of Schooling this man that wanted to be a farmer had earned all types of degrees relating to agriculture; it had been reported by professional farmers, that with all this man's degrees and knowledge in farming, his farm would be one of the best farms in the world. My buddy said With all this man's knowledge relating to agriculture, yet this guy never "owned" a farm, he never dug a hole, and never planted a seed and he and never produced a harvest. My friend said there was one thing wrong with this man who wanted to be a farmer he never put into practice all the knowledge he had learned about farming. The problem with education is, if it is not applied, it will never produce a crop. Likewise, this is how it is with God’s word If a Christian does not apply God’s word to their situation it too will never produce the desired results promised by the Lord. Do not be like this man, who was full of knowledge but failed to produce a crop because he did not apply his knowledge to farming. If a Christian hears God’s word but fails to apply God’s word to their everyday life, there will be no results, or, no change, in the Christians character or conduct, they will continue in performing bad habits (James 1:1:23). A Christian that chooses to be a doer of the word will try their hardest to guard their thoughts and their heart because the Bible says out of the heart proceed evil thoughts (2-Cor.10:5). Also, the Christian that reads “love one another” will try his or her hardest to walk in love because Jesus commanded Christians to walk in love (Col.3:1-25). Like the apple farmer who attended school to further his education, likewise, James said if any of you lack wisdom, let them ask of God, who gives freely to all who ask (James 1:5-6). In the Bible, James describes two types of Christians, the first type of Christian hears the word understands it but does not apply it to their life. And another Christian hears the same word knows what he has heard, goes away and does what the word had instructed (James 1:22-25). Jesus said this Christian God will bless in whatever they do (Rev.22:14). Jesus said it is not the hearer of the word but the doer of the word which will inherit eternal life. Jesus said, blessed are those who do His commandments, that they may have the right to the tree of life.